Eco-nique Kindle 3 Hemp / Global Wireless 6 inch / 15 cm Design Authentic embroidered patterns flow along the surface of this innovative yet earthy and custom-made case giving your e-reader a pleasant book-like cover as well as storage for notes and business cards. Hearty and sturdy this case offers superior protection for the delicate screen of your device with a unique style that's only available from Eco-nique! Professional feel with a fun home-grown aesthetic. Features Made from natural hemp & cotton with artificial interior leather pouch - no animal products used in this case - 100% animal free Paper and business card pouch Mesh openings for speakers. 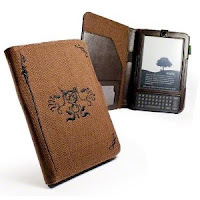 Not compatible with Kindle 1 & 2 only compatible with Kindle 3 first released September 2010 Reconnect with your favourite literature and keep it natural with Tuff-Luvs hemp e-reader case. This is an excellent cover - warm and tactile. The most viewed negative comment mentions a shiny button clasping the top of the kindle. The makers must have taken this feedback on board as they've now removed it, replacing it with a very unobtrusive but secure fastening.